Dürfen wir vorstellen: unsere Sprachheldin, Spotlight Corrector Woman. Ihre Mission: das Aufspüren typisch deutscher Fehler. Everybody makes mistakes when speaking another language, but it can be frustrating if you make the same mistakes again and again. 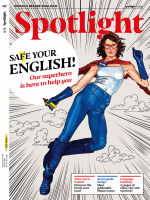 What you need is someone to point them out to you — and this is why we created our very own language heroine, Spotlight Corrector Woman. Her first mission is in London, where Jakob (who is German) is working for six months as an internPraktikant(in)intern in a recording studio. Jakob often makes mistakes in English that are typical for German speakers. See the mistakes that Spotlight Corrector Woman highlights — and learn from them. Will, Jakob's English colleague at the studio, needs some help. In the conversation below, Spotlight Corrector Woman has highlighted Jakob's typical German mistakes in bold. While reading the text, think about how you would correct them. Will: Could you check these microphones for me this morning, please? Jakob: Sorry, I’m really busy. I have to finish all of these scripts until midday. They need them in the studio this afternoon. I would do it for you if I would have time. Will: No problem. I can do it later. Jakob: You could bring them to Helen. She might be able to do it for you. Now, it's your turn. First, decide what Jakob should have said. Then expand the box below to show a correct version of the conversation. You'll find Spotlight Corrector Woman's explanation below. To talk about unreal or hypothetical ideas, use “if” + past tense. Don’ t translate directly from German “würde”. “Bring” always means towards the speaker; “take” means away from the speaker. Now test what you know by trying this exercise. Eine ausführlichere Version dieses Artikels finden Sie im Spotlight Magazin. Dieser Beitrag stammt aus dem Spotlight-Magazin 10/2017. Die gesamte Ausgabe können Sie in unserem Shop kaufen. Natürlich gibt es das Magazin auch bequem und günstig im Abo.